If your website is your center of operations for your fans, your EPK is the center of operations for the media, which has entirely different needs. Media people coming to your EPK want to know why you are “newsworthy”, which means there is a much greater emphasis on two things: the information contained within the biography (which shows the media member that you are worthy of coverage) and the delivery of everything a member of the media would want or need should they decide to cover you. In other words, you do their job for them and hand them the finished product with a nice bow on top. Nothing will get you further with the media than making them work as little as possible. 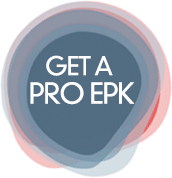 Contact us today and let us create you an EPK that gets you coverage!